In addition to our Training Camp Takeaway series, we at PFF are also hot on the trails of some intriguing rookies to keep your eyes on as we progress through the preseason. Some rookies are wowing during their first training camp and may be pushing hard for some well-deserved, extra snaps during preseason games. Cole was drafted by Arizona in the third round to provide key depth along the interior offensive line. However, with the recent season-ending injury to A.Q. Shipley, Cole may have an opportunity to start at center in his rookie season. Cole was a four-year starter at Michigan who bounced back and forth between left tackle and center throughout his career. His only experience at center came during the 2016 season where he ranked in the top 20 in run-blocking at the position. Where Cole struggled as a center was in pass-blocking, allowing 16 total pressures and posting a pass-blocking efficiency of 96.9, T-99th out of 130 eligible centers. Cole’s versatility should offer a big upgrade to an Arizona offensive line that finished 31st in the NFL last season in pass-blocking efficiency and ranked 27th in PFF’s preseason offensive line rankings. The Rams didn’t select until the third round of this year’s draft, but they may have got a steal in Okoronkwo in the fifth round. PFF’s fourth-ranked edge in the 2018 class, Oklahoma’s Okoronkwo racked up 47 total pressures and a career-high 46 defensive stops in 2017. Okoronkwo showed well at the Senior Bowl with a 50 percent win rate in one-on-one drills (second best of any edge player) and was the highest-graded defender in the game. The Rams roster is loaded with veteran talent, especially on the interior defensive line with Aaron Donald (94.0) and Ndamukong Suh (85.6), finishing first and 14th at the position in overall grade, respectively. However, if there is a weak link in the defense, it was on the edge in 2017 where no player produced a 70.0 or higher pass-rushing or run defense grade. 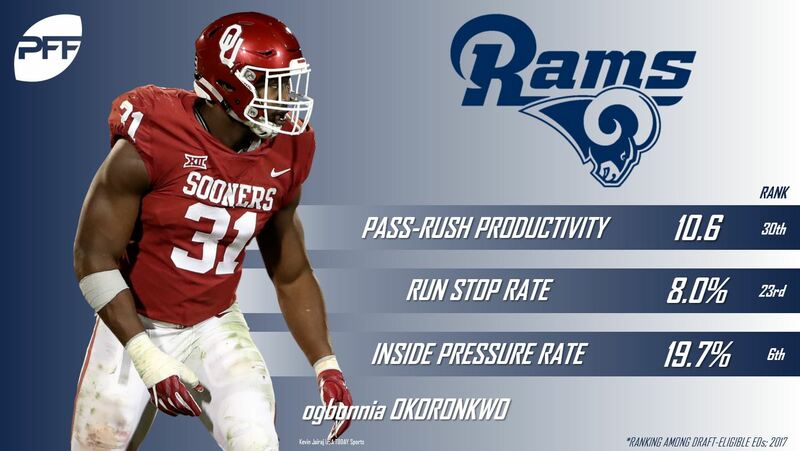 If Okoronkwo’s aggressive play is tailor-made for Wade Phillips’ dynamite defense. 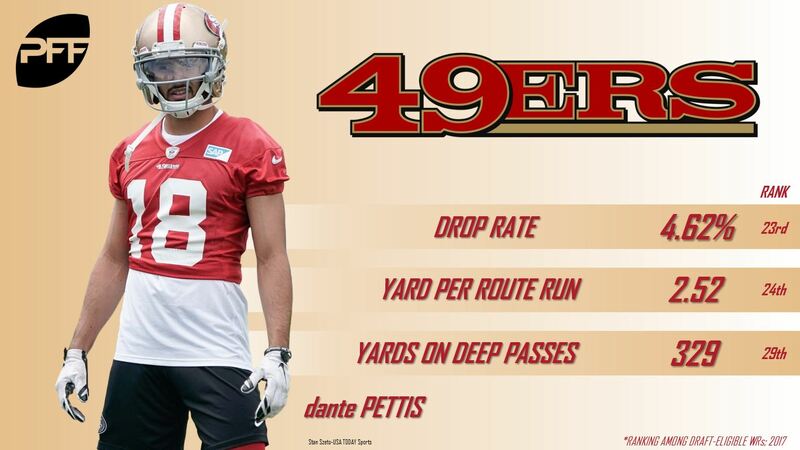 Pettis is already making a name for himself among coaches and players in his first 49ers training camp. The former Washington wide receiver is a smooth route-runner with reliable hands that has the ability to develop into a security blanket for quarterback Jimmy Garoppolo. He dropped just seven of his 169 catchable targets throughout his Huskies career and adds even more value with his special teams prowess as a returner. In 2017, Pettis dropped only three of his 64 catchable targets, good for a drop rate of 4.62 percent that ranked 23rd in the nation. Pettis has the good fortune to develop behind veteran Pierre Garcon who finished tied for first the NFL in drop rate with zero drops on 40 catchable targets before an injury ended his season. If Pettis can continue his positive momentum this preseason, he should be able to carve out a role in multi-receiver sets in San Francisco this season. The Seahawks finished last season tied for 17th with a 69.7 overall grade as a special teams unit. Seattle’s 2017 punter, Jon Ryan, has his work cut out for him as the team selected PFF’s top-ranked punter, Michael Dickson, in the fifth round of this year’s draft. Dickson led all collegiate punters in grade, average distance (47.5) and net yards (44.2) in 2017. Dickson was also named the Texas Bowl MVP after an 11-punt game in which he knocked an impressive 10 punts inside the opponent’s 20-yard line. While you always worry about sample sizes in college for kickers, it’s difficult to fake leg strength and accuracy, and Dickson has both. Last season, Ryan finished with an overall grade of 67.6, which ranked 18th among punters, and posted a 38.8 net average distance, which ranked T-32nd among all punters. If Dickson can showcase his talent in camp, it’ll be difficult to imagine that Ryan will hold him off to be Seattle’s punter this season.